Hazelnut natural flavor has a sweet and buttery goodness. This smoothly crafted flavor sparkles in your baked treats. 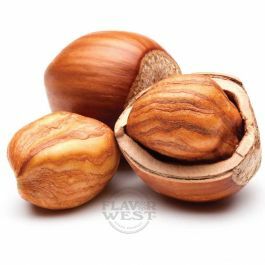 Type: Hazelnut Water Soluble Flavoring. Ingredients: Natural and Artificial Flavoring, Propylene Glycol. USP Kosher Grade Flavoring. Usage Rate: 15-20% for E-use. Flavor Suitability: Drinks and beverages, smoothie, desserts, pastries, baked treats and more. Specific Gravity: 1.05 No Refunds on Flavoring. Wonderful flavor. I will go threw two tanks of this in a day. i have tested many hazelnut flavors, but this knocks them all of the table. it smells like a hazelnut vanilla cream and the taste is so goooood! i use this as standalone and for mixing with tobacco.